The absence of black fathers in the home is said to be the number one cause for African Americans having the highest percentage of people subjective to poverty. The percentage of children living in two-parent homes has risen since the year 1995, and in my opinion the message is becoming clear. Because in the inner city resources are sometimes limited, some black men don’t see marriage as an option. They don’t have good jobs, and some of them are barely making it, so instead of just duking it out and being a part of their childrens life, they abandon them. Sometimes not by choice. They may do time for a crime in jail and be away from their children for years at a time. They may even be killed on the streets. Then of course you have that one man who is not ready to be a father and just disappears into think air. I myself am the child of a fatherless home. Many people believe that children aren’t raised right when their father is not present, but to be frankly honest black women have been raising their children alone for quite sometime now. We don’t always look to government assistance for help, because now we are graduating from college with MBAs, and Bachelors. We are owning our own business, and there are so many opportunities out there now that we don’t have to lean on the government. Some of us still do need that extra help, and I don’t believe that you are any less of a mother if you have to accept help. It is for your children, and no matter how people rant and rave about the tax dollars everyone was not born with a silver spoon in their mouths. Of course in the early part of the twentieth century the father was mostly married to his children’s mother. if he was to go out and cheat, and have other children because marriage was such a powerful union in say the 1920’s there was no divorce or separation. 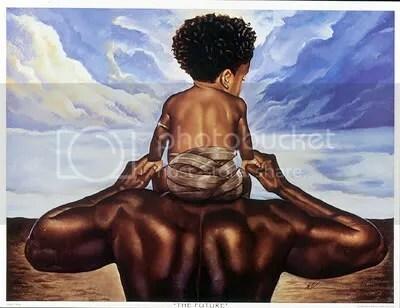 Though the absence of black father’s is still an issue in the black community I do believe that it is beginning to register to black men that it’s time to step up and be a man. It is not at all rare to see a young black father in the store with his baby buying diapers and milk. We are taking ownership of our responsibilities, because in the past we were held responsible for that gap in the homes where the father was not present. Fatherhood as well as motherhood can be very rewarding. I believe if we encourage our young men more, nurture and guide them to the right paths in life along the way, that they will turn out to be wonderful, strong father’s not so willing to abandon their children.